I think it’s finally time to come to the conclusion that not all food looks good. 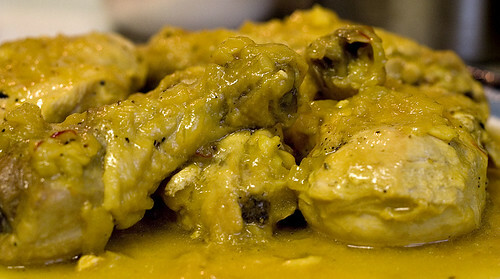 I suppose it’s a bit hard to make a yellow tinged chicken covered with a yellow sauce look appetizing, particularly in a picture. When I showed the picture to Angela, she agreed that it didn’t look good but did, without prompting, declare that it was good. So it at least has that going for it. I had originally decided to preserve some lemons when citrus season first stated here in California. I didn’t really have a clue what I’d do with them but it seemed the right thing to do. Given the length of time they needed to mature, I had somewhat forgotten about them. They had been sitting in a mini-fridge that I use from time to time (it’s a good place to cool stock or for drying pancetta, for example). For dinner the other night, I really wanted something different. I wanted something exotic but familiar, all at the same time. This recipe seemed a good fit, not least because I had all the ingredients that I needed. This recipe is apparently the classic Moroccan dish. Given my knowledge of Moroccan cooking (witness the Moroccan-style pork fiasco), I’ll have to trust the cookbook on that one. Despite my previous desicration of the cuisine of Morocco, I decided to modify the recipe. The original recipe had olives. I removed them partially because I don’t like them (as Will can attest, I’ve tried them multiple times and have yet to find any I like) and partially because I don’t have any. I also removed diced cilantro and parsley because I didn’t have any (our fresh produce stock was limited as we had been on vacation for a week and a half and the farmer’s market isn’t until Sunday). 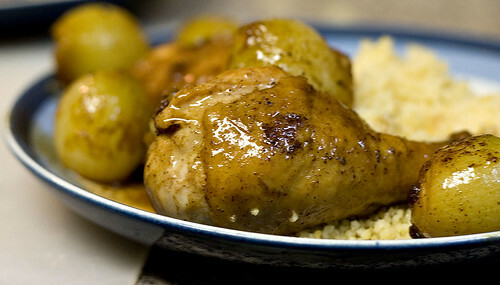 I still think it turned out fairly well while still managing to be somewhat Moroccan (at least it wasn’t pork). It was pleasantly lemony without being overly tart. I’ll make it again when I want something exotic but familiar. 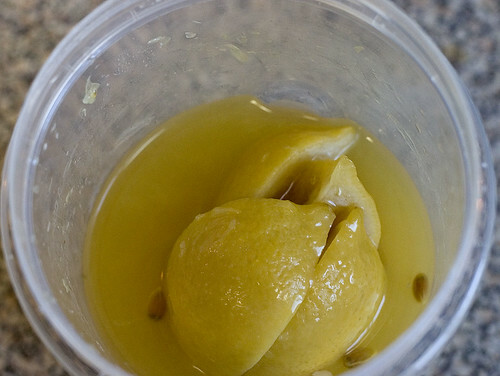 And, while it may seem like a good idea, don’t take a bite of preserved lemon right out of the container. I didn’t know anything could be quite that bitter and salty at the same time. Heat the olive oil in a wide sauté pan over medium heat. Add the onions and sauté until softened, then add the garlic, saffron, and ginger. Season the chicken on both sides with salt and pepper. Add the chicken to the pan. Pour in 1 1/4 cups water. Simmer, covered, turning occasionally for 15 minutes. Remove the breasts and cover with aluminum foil. Simmer for 25 more minutes. Return the breasts to the pan. Stir into the sauce the lemon juice and the preserved lemon peel. Simmer uncovered for 10 minutes. Remove the chicken pieces and simmer the sauce for additional time if the sauce is still too thin. Clean the lemons thoroughly. Cut the lemons into quarters while still leaving the quarters attached at the stem end. Place 1 tbsp of salt in the center of each lemon. Put in a non-reactive container and store in a cool place for 3 to 4 days. Press the lemons down in the container as much as possible and then add the lemon juice to cover them. Store in a cool place for 1 month. To a certain extent, this is penance. For some reason, it never clicked that Moroccan-Style Pork Tenderloin couldn’t be Moroccan because of the pork. I was just looking for a new way to cook pork tenderloin. But it made me wonder what Moroccan food was. Middle Eastern cuisine isn’t something that I’m intimately familiar with. The closest I’ve come is one of several Lebanese restaurants in the area. What I’ve had I’ve liked but Lebanon isn’t that geographically close to Morocco. So my only connection to Moroccan food is through cookbooks and thankfully I’ve moved on from the one that directed me to Moroccan-styled Pork Tenderloin. I chose Chicken with Caramelized Baby Onions and Honey because we had chicken on-hand and it seemed suitably exotic as well as not terribly difficult. All of which were true. Chicken with cinnamon is an unusual flavor combination to my western taste buds. It’s not bad by far. It’s just different. I actually liked it even if I wouldn’t want to eat it every day. They honey added a pleasant sweetness without being overpowering. It also managed to caramelize significantly. I did make a slight mistake when I made it. I originally missed the addition of the onions right after the white chicken meat is removed. I realized it about 10 minutes later when I went to turn the chicken. The onions were fully cooked but they didn’t manage to caramelize quite as much as was indicated in the original recipe. I didn’t notice that much of a difference but it may be even better with properly caramelized onions (hence the title). Blanch the pearl onions in boiling water for 5 minutes. Drain. Once the onions are cool, peel them and cut off the root end. Dry the chicken with paper towels on all sides. Season with salt and pepper. 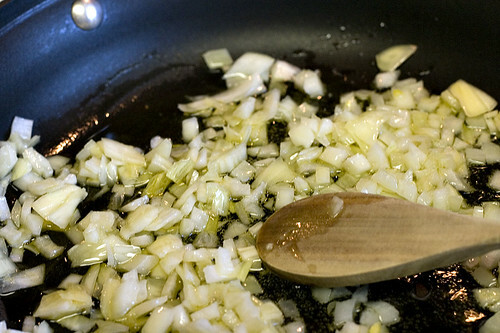 Sauté the diced onion in a large skillet over medium-high heat. Stir in the saffron, ginger, and cinnamon. Brown the chicken on both sides in the skillet, in batches if necessary. Return all the chicken to the skillet. Add 1 cup water and bring to a simmer. Cover and simmer for 15 minutes, turning the chicken once. Remove the white meat pieces of chicken to a side dish and add the peeled pearl onions. Cover again and simmer for 25 minutes, turning the chicken onces. Remove the chicken to a side dish. Stir the honey into the pan. 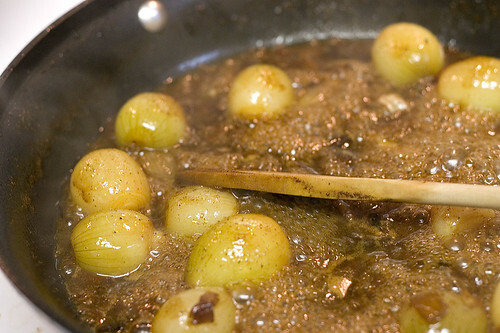 Cook, uncovered, over medium-high heat until the water has evaporated and the pearl onions have caramelized. 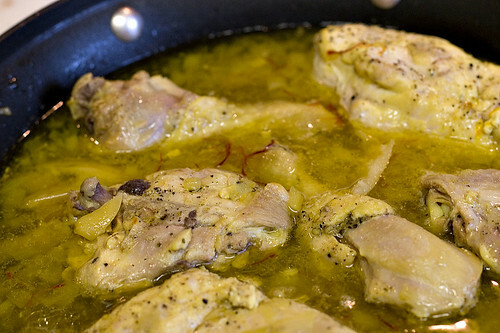 Return the chicken to the skillet and simmer until the chicken is warmed through. Serve the chicken topped with the pearl onions and the sauce.